Sony KDL-40HX853 review | What Hi-Fi? Awards 2012 Product of the Year - TVs. A stunning set. The Sony KDL-40HX853 stands out from its rivals, not least because of its distinctive design. Like the excellent 46in and 55in screens in the HX series we’ve tested, the KDL-40HX853 uses the tough Gorilla Glass screen that’s used widely in smartphones. The 40in screen sits atop a full-width plinth, at a relaxed angle. The plinth also houses the speaker system, giving the Sony an edge in sound quality over rival TVs. As a result, sound is marginally more substantial and has less of a sibilant edge here, with dialogue easier to hear. But it’s with picture performance that this Sony positively shines. Clarity and detail definition are remarkable, with the TV effortlessly bringing out subtle impressions of texture and colour where most rivals struggle. Put on the Blu-ray of Star Trek and it manages to pick out stars that were hidden on other sets. The LED backlighting shows its talent as well, maintaining black levels that are smooth and deep, making the bright flashes of flares and sparks all the more punchy and exciting. The Panasonic TX-P42GT50 plasma still fares better with lowlight detail, but the Sony’s colour balance strikes a more neutral, natural balance. We switch to Mission Impossible: Ghost Protocol to test upscaling to 1080p, and we keep forgetting that we’re watching a DVD rather than a Blu-ray. Images are clear and crisp, with no noise or blurring. The Sony may have to battle it out with Samsung's UE40ES8000 when it comes to outright detail refinement with Blu-ray content, but the KDL-40HX853 is far better at upscaling. The Sony is an active 3D set, and comes with chunky rechargeable glasses. (Extras will cost £60 a pair.) 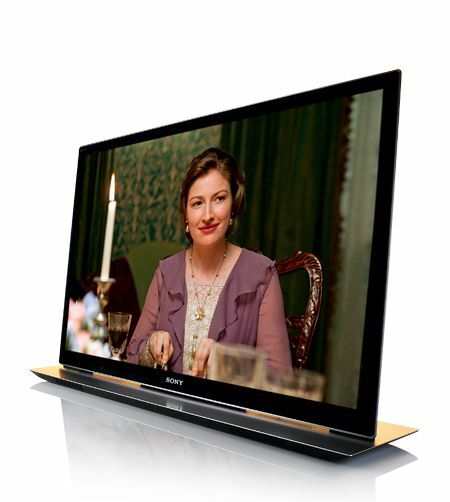 You can feel your eyes working – passive sets such as the LG offer more comfortable viewing – but the smooth motion and sense of depth immerses you into the beautiful Victorian world of Hugo. There’s no Freesat tuner, but tuning Freeview HD channels is a fast and painless process. Sony’s XrossMediaBar is one of the best graphic interfaces we know – it even has little pop-ups explaining what each option does when you pause over the menus. And while most other TVs require you to remember which input you’ve used, this Sony helpfully adds a little graphic next to the input in use – it’s a little thing, but it makes such a difference to the user. The remote control is a comparatively slim affair, and is highly responsive with intuitively placed buttons. Along with the ability to play multimedia content from devices over your home network, there are dedicated tabs for on-demand music and video, as well as widgets for Facebook and Twitter. The Sony Entertainment Network (SEN) hub offers you HD movies from LoveFilm, TV shows from BBC iPlayer and Demand 5, web browsing and game apps, all neatly arranged in grids. Sony KDL-40HX853: VerdictThere’s plenty on offer from the Sony KDL-40HX853, and its price tag of £1000 makes it a highly desirable TV. With its brilliant picture performance, features and great design, it’s the one to beat.